100% patented waterproof design in Australia for ease of mind. Use A1 snapper frames to display custom poster outside of your business! The outdoor snap frame is a patented waterproof clipframe, designed specifically to be mounted outside of your business to be resistant to rust, water, and other weather. 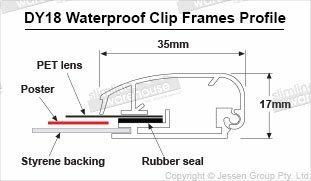 There is a rubber gasket inside the frame that helps form a seal with the lens to keep water from seeping inside and damaging a poster. The PET lens is .4mm thick and features UV protection to keep your poster from fading from sun exposure whilst on display. A1 snapper frames, like a poster frame, can display an A1 (841 x 594mm) poster in either landscape or portrait orientation. 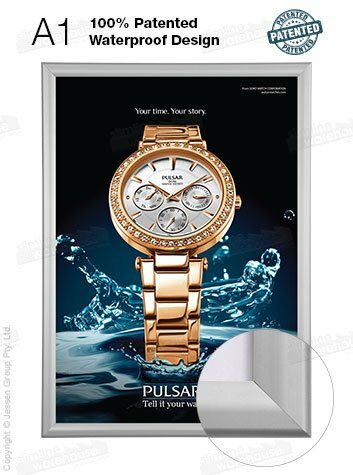 This poster holder utilises a snapframe design that makes changes quick and easy without any tools necessary. Snapping open the four sides of the display, removing the existing lens and protective lens and replacing the poster all takes less than one minute! Whether installed outside of museums, restaurants, shopping centres, petrol stations or transportation hubs, reaching passersby is easy in this protected poster frame. Durable anodised aluminium is used to make the frame, with stylish beveled edges, silver finish, and protective clear coating providing a classy look for all locations. We include a hardware kit for installing the frame at your location, with screw heads concealed within the frame to keep them out of view. 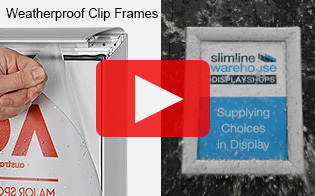 Order this snap frame by 2pm EST for same day despatch to anywhere in Australia when in stock, only from Slimline Warehouse!